Messaging could be a great solution for a lot of projects regarding an inter-systems (and components) communication. But which vendor to choose? Which one is the best? There is no proper answer for this question, because each and every provider has some pros and cons. Please read the first description of all of them and figure out only those matching your requirements. If your results include ActiveMQ, HornetQ and RabbitMQ, you are propably interested in performace and some practical observations now. And that is what is this article all about. We leave all the brokers in the default setting, no additional tuning was done yet. If you have some special requirement, you should probably look deeply at the features of the brokers and count in the final results. One broker, one producer, one consumer on the only one server. One broker running on the server one, one producer, one consumer running on the server 2. 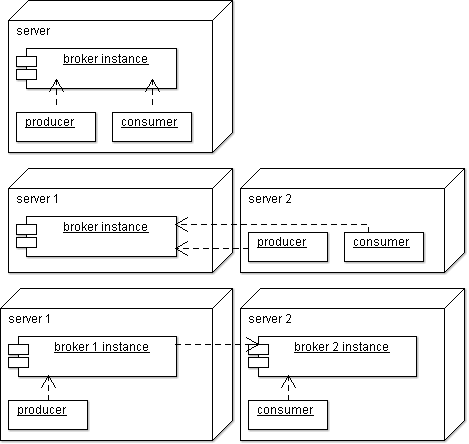 Two brokers running on different servers (forwarding messages / bridging), one producer running on the server 1, one consumer running on the server 2. Because proportion of the results for the different scenarios is almost the same, we can focus only on the first scenario to invest the results and do the comparison. Running on Linux system in virtual machine with 2 cores and 8 GB RAM. HornetQ really shines in the performance and it is pretty useful with a good support as well, but a lot of features (for instance the management console) is tightly bound with running as a JBoss module. Running in a stand-alone mode (as I did) has several disadvantages and I would not recomment it. But if you are using (or going to use) the JBoss Application Server for running you web application, HornetQ could the right option for you. There is a bit mess in versioning of libraries, especially if you want to work with different vendors of components involved in the integration (Netty, Spring JMS, ...). Queues and topics must be declared in hornetq-jms.xml before and cannot be created and deleted dynamically using JMS API. RabbitMQ does not have a good performance and it is not very human-friendly (all the setting are written in Erlang, which makes longer configurations very unclear for a programmer). There is only a commercial implementation of JMS. You can use pure RabbitMQ libraries or the Spring AMQP, but it is a different approach from JMS and has several limitations, for instance AMQP 0-9-1 protocol used as native doesn't support durable subscribers.